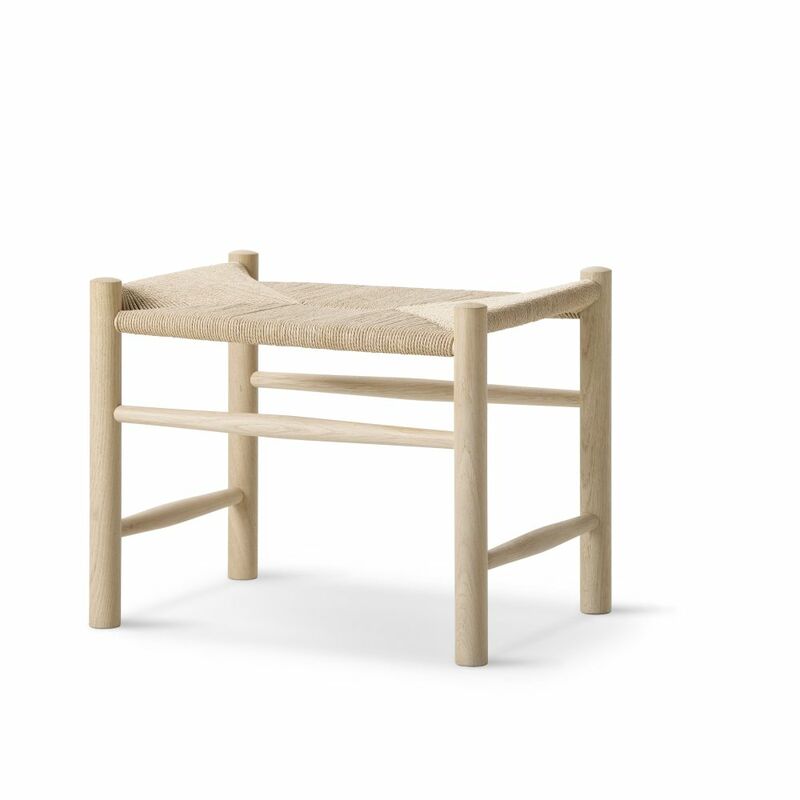 Wegner’s simple corded seat stool is an example of the Danish tradition of designing modern furniture using sticks and dowels. It can be used as a footstool as well as a standalone seat. In 1939, FDB hired the 28 year old architect Børge Mogensen as their chief architect for their visionary furniture programme. The vision was to create high quality functional furniture with a reasonable price tag that could make the ideas of simple modernism popular among the people. Mogensen decided that the furniture should all be based on established cabinet-maker’s principles found in traditional furniture types from around the world, while at the same time being adapted for ease of local production without compromising on quality. Børge Mogensen then invited his friend Hans J. Wegner to participate in this venture, which came to lay the basic foundation for the development of the concept “Danish Modern” in the 1950’s. A few pieces from the programme became so accomplished that they have been in continuous production ever since their launch in the 1940’s. Fredericia’s special relationship with Børge Mogensen have ensured that these models will always be a part of Fredericia’s ‘The People’s Collection’. Both Mogensen and Wegner’s furniture for “The People’s Collection” was based on an evolutionary design approach. Wegner’s rocker was inspired by traditional Windsor furniture, whereas Mogensen’s J39 was an evolution of methodology taken from Mediterranean region folk furniture. The C18 table was inspired by the functional style of the American Shaker culture. The durable and sturdy, yet refined quality of “The People’s Collection” makes the furniture suitable for both private and public use. And to this day, both new and vintage versions of the furniture can be seen in public institutions, universities, cafés, restaurants and private homes in Denmark as well as throughout the world. Wegner was the born the same year as his colleague and friend, Børge Mogensen, where they studied together at the Copenhagen School of Arts and Crafts in Copenhagen. During the 1940’s, Wegner created a number of furniture designs for the Danish Coop FDB, where Mogensen was head of design. In this work, Wegner restricted his design to follow the rational ideas of the pioneering furniture programme. The two designers also collaborated on groundbreaking furniture exhibitions where they projected the future for Danish interior design.